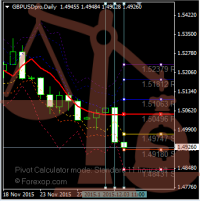 This Metatrader indicator is for calculating optimal stop loss and take profits. It predicts the chance of a trade ending in profit or loss. An easy tool that gives you the edge of the professional trader. The tool can analyze the market from 10-minutes ahead to any point in the future. Just set the target trade time and required win ratio, and the indicator will calculate the optimal stop loss and take profit levels taking into account the market conditions. The curves extended at the front of the chart show the probabilities of the price reaching a certain level in a certain time. From this you can see the exact range the price is likely to reach over time – and use this in planning the trade. The indicator is very simple to use and provides visual output directly onto the chart with which you can trade. The trade analyzer panel will examine any open trades and will calculate their exit probabilities based on the stop loss and take profit settings. 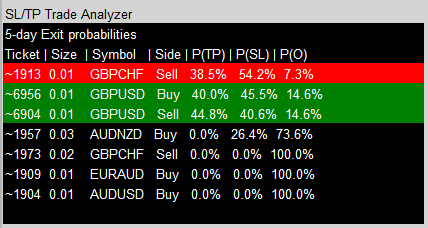 This will tell you the exact probability of any open trade resulting in a profit, a loss or remaining open. The trades are listed in order of the highest chance of closure. You can configure the indicator to monitor trades continuously and create an alert whenever any trade exceeds a certain probability of closure. The indicator can monitor any exit time-range from 10-minutes onwards. This graph displays the expectancy of both the buy and the sell side. 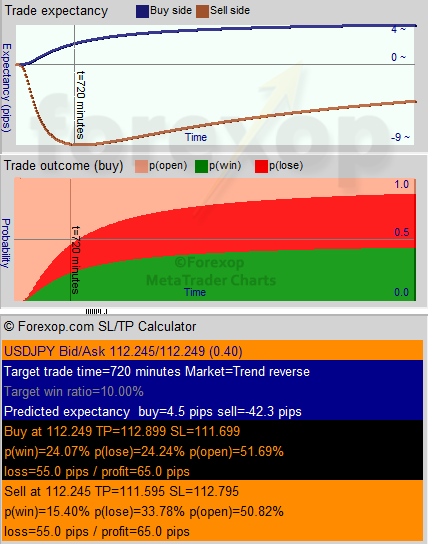 The expectancy is displayed in pips and can be understood as the mean profit that would be achieved if the trade closed at that point in time. The expectancy chart can highlight differences between the buy and sell side and show how those modify over any time period of interest. 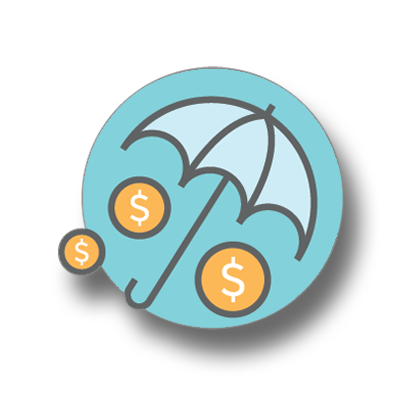 The predicted expectancy allows you to find trades with the highest probability of profit. The trade outcome chart plots the predicted outcome of any trade according to it’s stop loss, take profits, and the market condition. It shows the probabilities of the trade closing in profit, closing in loss, or remaining open against a time axis. This chart is highly useful since it shows the convergence rate for stop loss and take profit probabilities as time progresses. This allows you to visually see the trade risk. By default, the indicator will calculate the optimized stop loss and take profit for a given trade time, and required win/lose ratio. If you provide a stop loss and take profit as input, the indicator will work in “analyze mode” and will display the predicted outcome for a trade based on the values you have provided. The box above shows the indicator in “analyze mode”. You can use this to investigate the likely outcome of open trades as well the outcome of a potential trade with any combination of stop loss and take profit settings. At the front of the chart, the indicator will show the confidence lines that statistically predict the limits that the price could reach at times in the future, given the trend and volatility. See Figure 6. By default the indicator shows the 99%, 95%, 80% and the 50% confidence regions. These can be changed to different values in the setup panel. The maximal curves show the probability of the price reaching a certain level, within a certain time. You can set these to any percentage between zero and one. For example, the price has a 1% probability of touching the 1% curve. It has a 50% probability of touching the 50% curve. And so on. The regions expand with time. Using these curves you can easily find the probability of the price reaching any level within a certain time. This example is for the daily chart, but the same applies to lower or higher time frames. Trade time: The target trade time is defined in days or fractions of days. Win/loss ratios: Set the target win/loss rates. The indicator will find the nearest possible stop loss/take profit to try to achieve the target. Keep in mind that generally a higher win rate will require a wider stop loss and smaller take profit. A smaller win rate will allow a greater profit with a smaller stop loss. Alerting: The indicator can generate alerts whenever any of your open trades are approaching their stop loss or take profits. 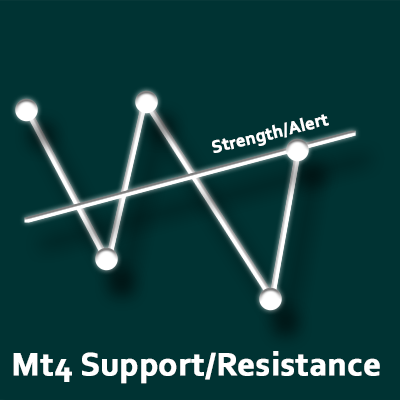 You can set the alert period and the probability for loss/profit at which to trigger the alert. Market: There are three options to choose from. The random model makes no prior assumptions about market direction. The trending model assumes a drift based on the current market trend and volatility. For example, when buying in an upward trend the drift would cause the stops to be calculated higher than with the “random model”. When buying in a downward trend the stops would be calculated lower. The reverse-trending model assumes the current trend is about to reverse and as such reverses the model drift parameter. It therefore does the opposite of the above. In a rising market, buy stops will be placed lower due to the assumption that the trend is likely to reverse. Trade side: Choose which outputs are to be displayed on the chart. Choosing “buy side” will display the buy side outputs. Choosing “sell side” will do the opposite. Curve probabilities: Choose which curves to display on the chart. Up to four maximal curves can be shown on the chart at once. The curves extend forwards in time. To display the curves, make sure the Metatrader setting “shift end of chart from right border” is on. The outputs from the indicator are based on statistical calculations of the probability of certain price movements over a given time period. For a further technical explanation please see the user guide.